This year (2015) I will be returning to South Africa to take on the challenge of the famous 90K ultra marathon Comrades - the Up Run. I will be documenting my training, the race itself and the recovery. The alarm trills at 3.45 am. I'm already awake however, having slept surprisingly well after a braii and pasta meal and a glass of good South African red. Porridge consumed, we get dropped off at City Hall Maritzburg and fight our way into Pen C. It's cold and dark, the mynah birds chatter in the trees and spirits are running high. At precisely 5.20 am, the tannoy blasts out the emotive 'Shosholoza, ku lezantaba, stimulate siphum Africa' and the crowd joins in, swaying in unison. Chariots of Fire follows - there's a lump in my throat. Suddenly we all move forward, there's a cannon shot and we are off. The journey begins. The roads in Maritzburg are already lined with supporters, some of them in their pyjamas, and braiis are already lit. Some of the African runners are chanting - its eerie but very emotive. Avoiding discarded bottles and bags, we get into a steady pace, overtaken by the keen and the inexperienced. My brother and running partner, Ian, wonders how many of them will 'come back to us' later in the race. Just 8K into the race we climb Polly Shortts which gives our first long 'down' and I ponder how cruel this climb must be on the Up run, over 80k in. The sun comes up gradually but it is thankfully still cold thanks to a large dark cloud - this is unusual for Comrades apparently but I thank my lucky stars that the impending heat is delayed. The road continues to undulate until we reach the Lion Park where the first of the big crowds are waiting and cheering. We are climbing now, heading the the highest point of the run, Umlaas Road. We pass the smelly chicken farms and head for CamperDown where huge crowds can be heard from some way off, and, as arranged, we meet and are cheered on our way by my husband, draped in the Union Jack flag. The signs say 60K to go- we are a third into the race. Harrison Flats are upon us - a pretty uninspiring and flat landscape but a welcome relief from the climbing and a chance to get into a good rhythm. No time for comfort however as the Valley of a thousand hills approaches and is true to its name. The next big hill will be Inchanga but first we must pass through the tunnel of cheering school children from the Ethenbemi Home. Ian high fives at least half of them and I wonder how long he will keep that level of energy up! The sun is fully up now and the heat is rising as we approach the infamous Inchanga hill. Luckily, it meanders so I can see exactly how long or steep it is. We chug up, fuelled by the Energade station on the lower slopes, and as we traverse yet another bend on our way to the top, it reminds me of Chapman's Peak on the Two Oceans race. No time for reflection at the top as we head towards Drummond, the half way point of the race. I check my watch for the first time at 26.2 miles, just as a marker, and I note the time: 3 hours 43. We descend into Drummond to the sound of cheering, clapping and horns. The crowds are incredible and my Union Jack vest produces shouts of 'it's the Queen!' and 'diamond jubilee!'. We are half way in 4.02 and I wonder what the 2nd half has in store. The climb out of Drummond to Botha's Hill is long and tough. By this stage, many are walking or on the side of the road, getting rubbed down. I remind myself of the training I have done and refuse to daunted by the hard task ahead. We pass Arthur Newton's seat and the Comrades Wall of Honour which I shout out to Ian. 'what do you mean, you have hit the wall?' he mis-hears and runs on regardless. Just as well I am still feeling OK then! Reaching Alverstone on a long climb, we Start to descend once more and my quads and knees start to complain. I ignore it, knowing full well that there is more torture to come. Onwards we run to Hillcrest and I look forward to seeing John and to counting down the last 30K. From here on in the going gets tough with a long descent ahead on very tired legs and Ian tells me that that is where the work really begins. What does he think I have been doing for the last 60K - relaxing? From Kloof at the top of Fields Hill we now have 25K to go and in my mind I convert it to miles, separating it into 6 mile chunks. Anything to take my mind off the distance and challenges ahead when my body is tired and my legs sore. But Fields Hill takes no prisoners and the 3 continuous kilometres of jarring descent sends shock waves through my overworked quads and my poor knees. I am reminded that this is where the race is won or lost. Im not going to let it beat me - I can see the sea now so I know I am getting closer. At Pine town we are 75K in. It's fair to say that there is not much chat going on between us from here on in but a mutual knowledge that we are in the way home. It won't be an easy ride, however, with 3 hills to go and more punishing downs. Onwards we push to Cowie's Hill and the ascent of 45th Cutting at 81K in. We are mostly on the highway now, the camber is cruel and it's very hot with the sun's heat reflecting off the asphalt. Throw in the harsh downhill slope and you have a recipe for smashed quads. Never have mine been so tight and so sore. Block it out ! Ian reminds me that we have Tollgate left to climb on the highway, with just a few Ks to go 'it looks worse than it is' he warns. It looks very long and very steep. What a cruel finale to the race. How to finish off even the steadfast competitor. With a massive effort we make it, and cross the flyover into Durban. I know I only have 3K to go but it seems like a mountain. Ahead of us we see The Golden Mile - adorned by yellow banners. Surely I can keep it going for the equivalent of just 4 times round the track? But ahead of us they open the barriers to let supporters cross and hundreds of people rush into the road from both directions, a constant stream of bodies which we run headlong into. At this point it's about self preservation and we are not about to let anything stand in our way. Finally, the Sahara Kingsmead Stadium is in sight and we hear the roar if the crowds. It's just a half lap,of the track but it feels like so much more! The noise is deafening, there is colour everywhere and I know I have made it. 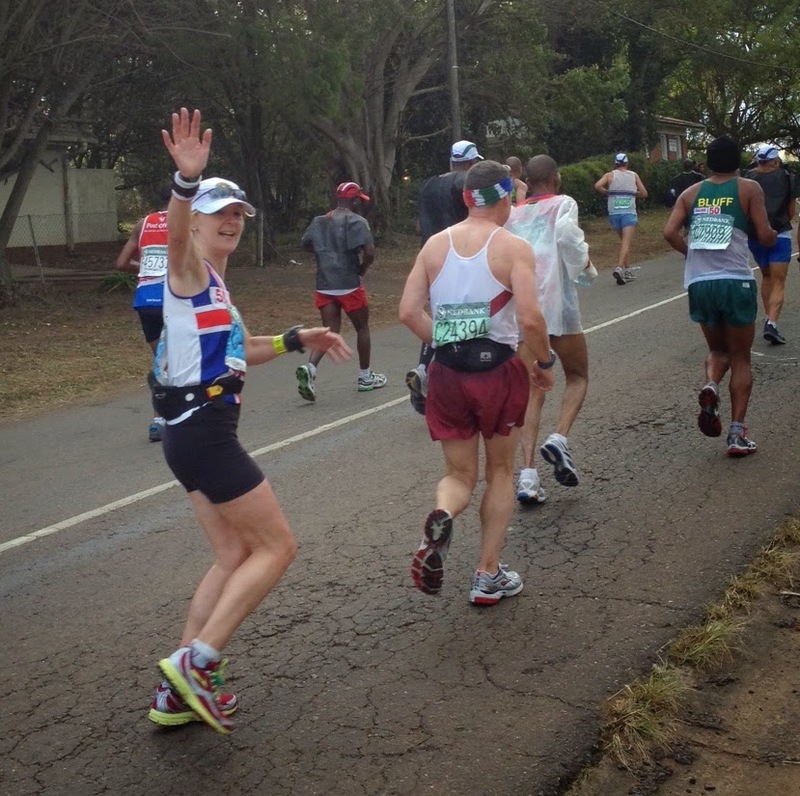 We cross the line and I am instantly part of Comrades history, Queen of the road and invincible. 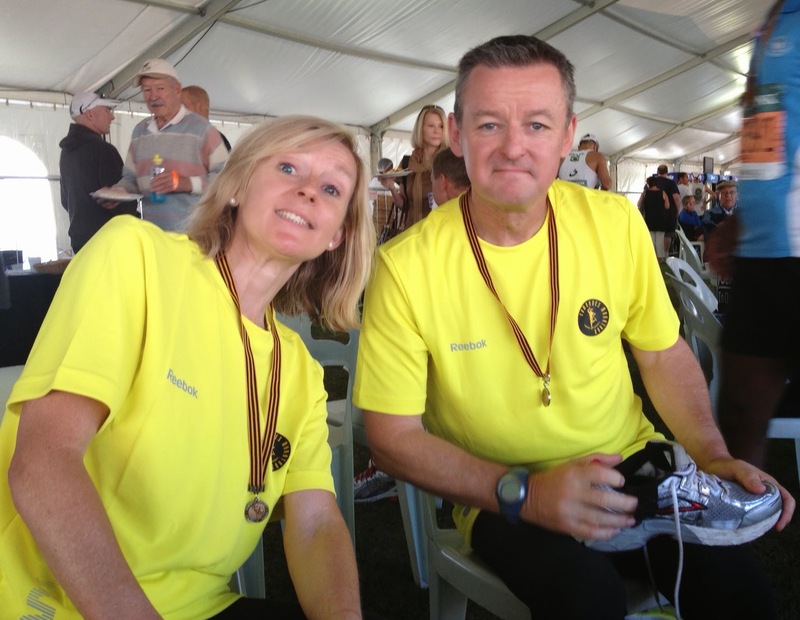 For me, it's mission accomplished having run every step and every hill and securing my Bill Rowan medal. To achieve an 8.09 finishing time and 1st in my age category is far beyond my expectations. Comrades has taken everything out of me but given so much back. I will be eternally grateful.